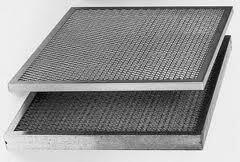 Flanders models MS and MSG Moisture Separators are designed for use in air handling systems requiring collection of water droplets or oil mist. Water droplets in outside air are usually fog. In supply air, water droplets may occur as carry over from cooling coils and evaporative media or moisture downstream of humidifiers. Oil mist in return air is most often found in production machine shops.